The Emir Habibullah Khan brought golf to Afghanistan in 1911, which was the very year that the US Open was won by an American for the first time. Like many who take up the game, Habibullah became obsessed to the point of neglecting other aspects of his life. Thus the New York Times reported that Afghanis "got into the habit of placing petitions into the holes at night in the hope they would reach the Amir when he was putting the next day." Such was the ruler's love for the game that he was interred on a course in Jalalabad following his assassination in 1919. The country was more inviting to visitors then, but the horrors of the following century appear to be abating somewhat. At the present a single, 9-hole course in the capital serves all the nation's players. 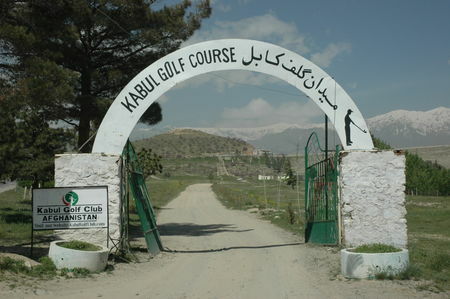 The Kabul Golf Club occupies a site that was fought over during the Afghan civil war; not surprisingly, the Taliban regime forbade the game as a manifestation of Western imperialism. Restoration of the course required clearing out mines and abandoned tanks. Kabul Golf Club does not of course offer world-class play, but the simple fact that it is open is a powerful symbol of the hope that true peace will finally come to this beautiful and tragic country. And don't worry about reserving a tee time; the staff is ready to accommodate anyone who makes the trip down Qarga Road.